Girls Are Taught To 'Think Pink,' But That Wasn't Always So After World War II ended, Rosie the Riveter traded in her factory blues for June Cleaver's pink apron. A new exhibit traces pink back to the beginning — when plenty of boys wore it, too. Men's suits weren't always so sober. This embroidered, pink silk coat was worn by a Frenchman in the court of Louis XVI in the 18th century. "It's a late 18th-century portrait of two children, who are both wearing dresses," she explains. "One is a pink brocade satin dress, one is a yellow dress, and they have these pinafores over them, and you can't tell if they're boys or girls." A copy of the Ralph Lauren suit made for Robert Redford in the 1974 film version of F. Scott Fitzgerald's The Great Gatsby. Finamore can tell by their accessories — they're wearing shoes and hats only boys wore then. But to most of us today, the kids look like girls. 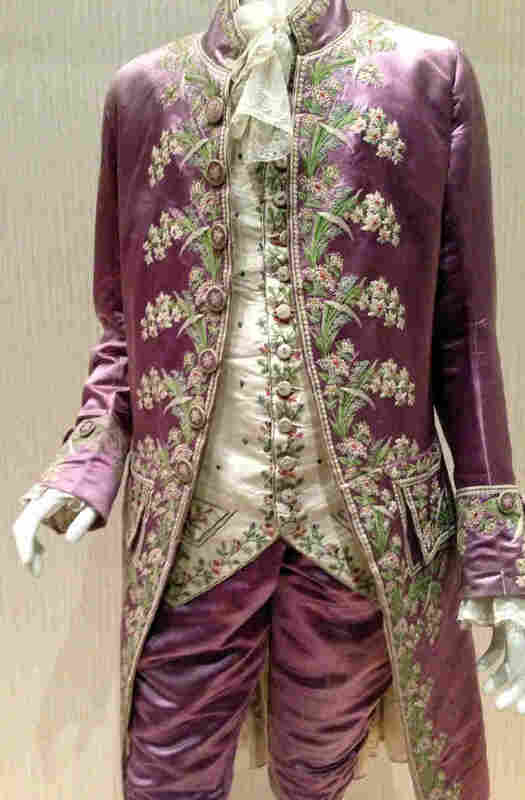 Nearby at the exhibit is a pale pinkish-purple silk coat worn by a Frenchman in Louis XVI's court. Any woman would be tempted to swap her pink Nikes for this gorgeous long coat, embroidered with intricate flowers. In A Journey Around My Room, published in 1794, French writer Xavier de Maistre puts pink into the male dream-space. He recommends that men have pink and white bedrooms to brighten their moods. Fast-forward to 1925. Characters in The Great Gatsby speculate about Gatsby's past: "An Oxford man! ... Like hell he is! He wears a pink suit." A version of that pink suit is in the Boston show — Ralph Lauren designed it for Robert Redford in the 1974 movie. Before Gatsby, a 1918 trade catalog for children's clothing recommended blue for girls. The reasoning at the time was that it's a "much more delicate and dainty tone," Finamore says. Pink was recommended for boys "because it's a stronger and more passionate color, and because it's actually derived from red." To our 21st century ears, all this men in pink stuff may sound a bit blushy. "It's so deeply entrenched in us and our culture," says Finamore. "We think of pink as such a girlish color, but it's really a post-World War II phenomenon." When the war ended and the men came home, Rosie the Riveter traded in her factory blues for June Cleaver's pink apron. In the postwar ideal, men reclaimed the workplace, and women stayed home with babies and shiny appliances. Femininity got wrapped in pink, and so did products — from shampoos to fancy fashion. Big, pink flowers bloom on ivory silk in this 1956 dress by Christian Dior. In 1947, after the shortages and rationing, and straight skirts of war, Christian Dior introduced the New Look. "It is this overtly feminine silhouette," Finamore explains. "You have soft shoulders, a bust line, a wasp waist and voluminous skirts." 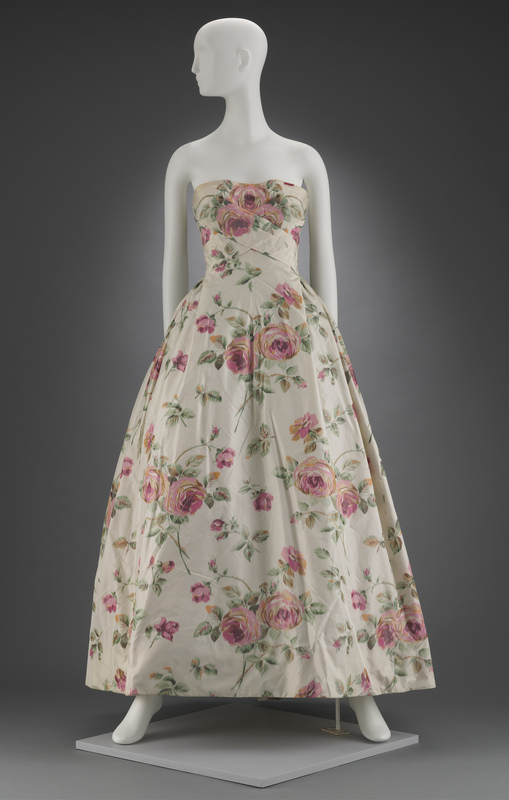 The Boston "Think Pink" show has a strapless Dior gown from 1956 — the ivory silk is blooming with large, pink flowers. "You barely see the little girl," says Finamore. "She's way back in the far right corner. And in front of her is this vast array of pink Hello Kitties, of pink dresses, of pink dolls, pink notebooks, pink anything you can imagine." 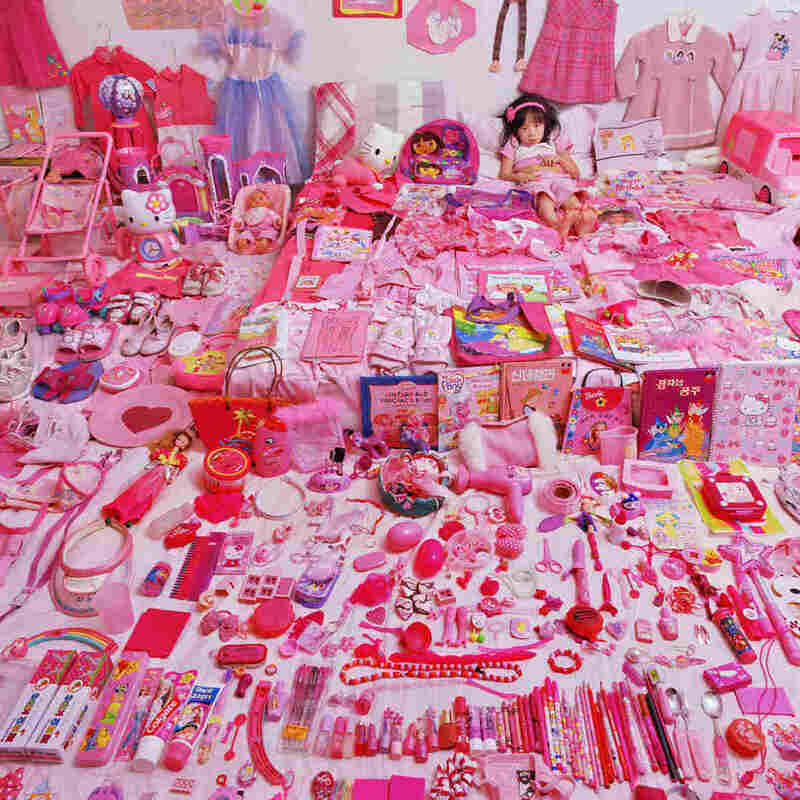 Thanks to marketing, Disney princesses and profits, the color pink has spread like measles. But at the Boston Museum of Fine Arts, where the "Think Pink" show is on through May 26, Finamore says these days of metrosexuals and shifting gender roles are loosening the color divide. Males are thinking pink again ... but will it ever be the new black?